The developer is converting the derelict former 19th century brewery into one, two, three and four-bedroom homes. Each of the properties at The Maltings has been creatively designed to marry the character of the former brewery buildings with a contemporary twist and will be built with Hazelton Homes’ customary attention to quality and detail. 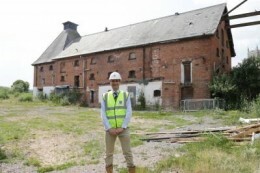 Commercial director Richard Hazelton said: “The Maltings buildings have tremendous character and we are delighted to be given the opportunity to bring them back to life. “The combination of village life with contemporary luxury homes set in iconic, eye-catching buildings is just the sort of thing that we are often asked about. The Maltings is located just off the High Street close to the centre of the village. It is thought to date back to the 1860s. The brewery closed in the 1920s but the maltings floors remained in use for a short time afterwards. Hazelton Homes will create 11 houses and 10 apartments by renovating and sympathetically extending the buildings and will restore original features wherever possible. With the River Soar and the redeveloped Sileby Mill Marina just a short stroll away, relaxing boat trips are among the many attractions in the area. These include excellent countryside walks, village playing fields, tennis courts, football and cricket clubs, plus the prestigious Rothley Park Golf Course just a short drive away.